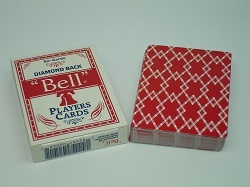 In a Pack of Cards TMCARDS, the front (or face ) of each card carries markings that distinguish it from the other cards in the deck and determine its use under the rules of the game being played. The back of each card is identical for all cards in any particular deck, and usually of a single color or formalized design. The back of playing cards is sometimes used for advertising which is well-served by TMCARDS Advertising Playing Cards. This particular custom-made Pack of cards by TMCARDS playing cards Manufacturer Company. This is small enough to tuck into a purse or backpack, is aimed at families on the go, and includes games and activities for kids of all ages. One can opt for custom and non-standard card shapes. The most common sizes for a pack of custom playing cards are poker size and bridge size, the latter being more suitable for games such as bridge in which a large number of cards must be held concealed in a player's hand. Interestingly, in most casino poker games, the bridge-sized card is used. Other sizes are also available as per the specifications of the customer. A Pack Of Custom Playing Cards by TMCARDS primarily consists of fifty-two playing cards + 2 jokers, called French deck in most languages but Anglo-American playing cards in English, includes thirteen ranks of each of the four French suits, diamonds (♦), spades (♠), hearts (♥) and clubs (♣), with reversible Rouennais court cards. Each suit includes an ace, depicting a single symbol of its suit; a king, queen, and jack, each depicted with a symbol of its suit; and ranks two through ten, with each card depicting that many symbols (pips) of its suit. The two jokers are TMCARDS registered jokers Unlike face cards, the design of jokers varies widely. Some decks include additional design elements. Some of TMCARDS related products like Attractive Playing Cards are unique. When it comes to fast, friendly, the finest quality and courteous customer service at the best price Go for TMCARDS Pack of Custom Playing Cards!! !